We are pleased to announce that Reichenbachia: Orchids Illustrated and Described is now available in the Digital Media Repository! 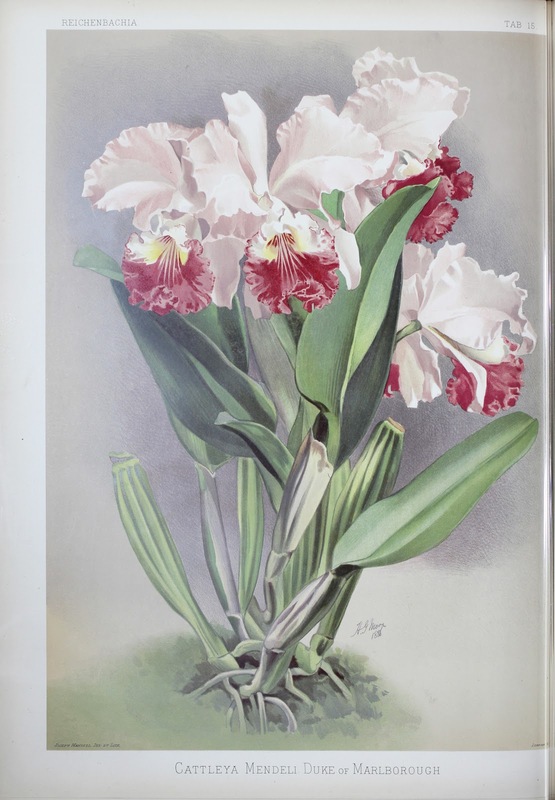 This four-volume 19th century text was the creative vision of orchidologist Frederick Sander and provides life-sized illustrations and descriptions of several hundred orchids. Reichenbachia, named after the renown German orchidologist Heinrich Gustav Reichenbach, was created over a four year span from 1886 to 1890 as a collaboration between Sander and English painter Henry George Moon, who provided most of the illustrations. The text was issued in two series, each containing two volumes, all of which were published in two year intervals from 1888 to 1894. The four volumes were dedicated to Queen Victoria; Augusta Victoria of Schleswig-Holstein, Empress of Germany and Queen of Prussia; Maria Feodorovna, Empress of Russia; and Marie Henriette of Austria respectively. Sander, the main creative force behind Reichenbachia, was born Heinrich Friedrich Conrad Sander in Germany in 1847 and later settled in St Albans, Hertfordshire, England, where he sold seeds and later concentrated on orchids. By the 1880's, Sander's nursery covered four acres with roughly 60 greenhouses. The collaboration between Sander and Moon, a landscape painter, was not without conflict. While Sander wanted the orchids to be depicted in an idealized way, Moon was determined to include natural imperfections in his work, and it was the latter approach that won over in the end. Moon would later marry Sander's daughter in 1894. All four volumes of Reichenbachia are held in print at Ball State University Archives and Special Collections, which is open to the public from 8:00 a.m. to 8:00 p.m. on Monday and Tuesday and from 8:00 a.m. to 6:00 p.m. from Wednesday to Friday. We are pleased to announce that the American Cities Historic Maps digital collection is now available in the Digital Media Repository: http://libx.bsu.edu/cdm4/collection.php?CISOROOT=/AmrcnCtyHis. 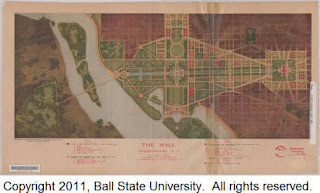 This collection includes 23 maps for American cities dating from 1855 through 1921. Cities represented include Chicago, Cincinnati, Pittsburgh, Louisville, Denver, San Francisco, Washington D.C. (pictured below) and others. The types of maps include street, topographic, park, city planning, and harbors. Zoomfy technology is available for detailed map viewing. The R. Milton Retherford House Architectural Drawings digital collection includes blueprints of a Queen Anne Style home built during 1890 in the Emily Kimbrough Historic District in Muncie, Indiana. The Frank H. Wheeler Estate Photographs digital collection contains 39 images of the estate, known as Hawkeye (pictured left), taken by H. H. Coburn Company soon after the house was built. Also included is a portrait of Douglas Wheeler, the son of Frank and Stella Wheeler. The Daniel B. 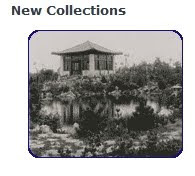 Young Landscape Architectural Drawings digital collection contains images of Daniel B. Young's design drawings and business and personal photographs. The Drawings and Documents Archive is a unique resource dedicated to preserving the history of the built environment in Indiana. Physical collections contain over 100,000 original architectural drawings, landscape plans, blueprints, photographs, models and building remnants that tell the history of Indiana’s sites and structures.